A former calculus student who is tutoring in a local elementary school stopped by to ask about how and why decimal points work in the lattice algorithm for multi digit multiplication. Here’s the residue of our conversation. Remember that Kamii quote from a few weeks back? These errors are usually considered careless errors. They are not careless errors; they come from an inability to think. Oh, and that other one? Yeah. They’re strong claims. Overly strong. “An inability to think” isn’t really right. “Not thinking in this circumstance” is closer to the truth. Kamii is not a woman of nuance. That’s part of what I enjoy about her work. But it does require interpretation. All of which builds up to an entirely predictable scenario yesterday morning. 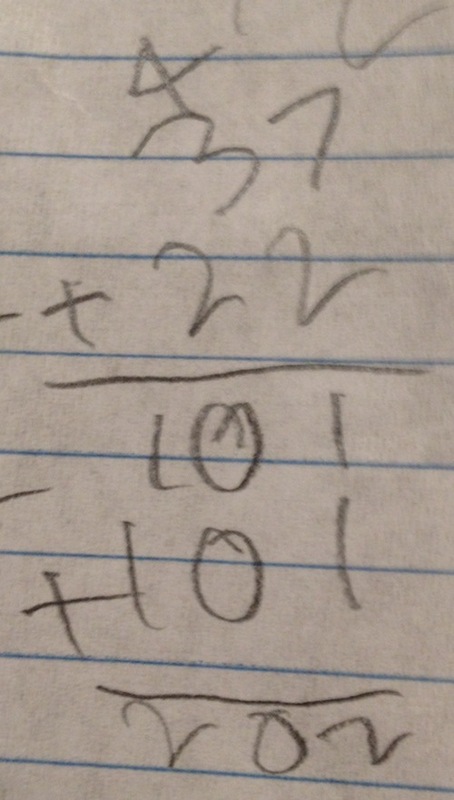 Griffin (who is seven years old, recall, and whose ability to think has been well documented here) has been well schooled in traditional addition and subtraction algorithms this year, and has learned the lattice algorithm. He loves the lattice, although he struggles to make a lattice neatly enough to do the algorithm (for reasons that will become apparent when you see his handwriting below). All of these are digit-by-digit, ignore-place-value-as-you-work sorts of things. That last post wasn’t really about the lattice algorithm. This one isn’t either. It’s about supporting claims with evidence. (The last one, in case you’re keeping score, was about crafting tasks that show instead of spiels that tell). Another claim my future elementary teachers like to make is that the lattice is inefficient for problems with large numbers of digits. The idea is that you have to spend a lot of time making that lattice before you can multiply. This stands in contrast to the standard algorithm, which you can just get started with straight away. So I began to wonder whether the lattice-drawing really did set one back. So I put it to the test. Ten digits by ten digits. On your mark, get set, GO! By the way, I was going to do three algorithms head-to-head. I was going to do partial products in the middle of the board. But about a third of the way through, I got fed up and quit. That one really is inefficient for large numbers of digits. 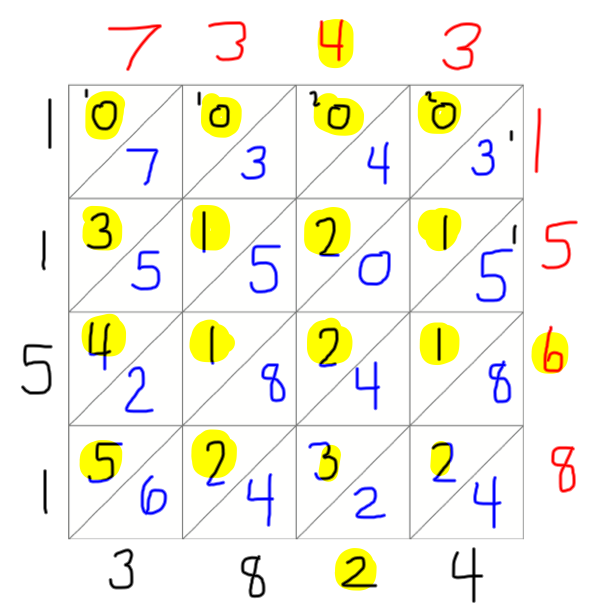 I’m going to assume you know the lattice algorithm for multidigit multiplication. If you do not, and if you would like a primer, here is one. This post isn’t really about the lattice algorithm, but it’s the context for what I’m really trying to say, which is this: It is worth the time to craft classroom tasks carefully. 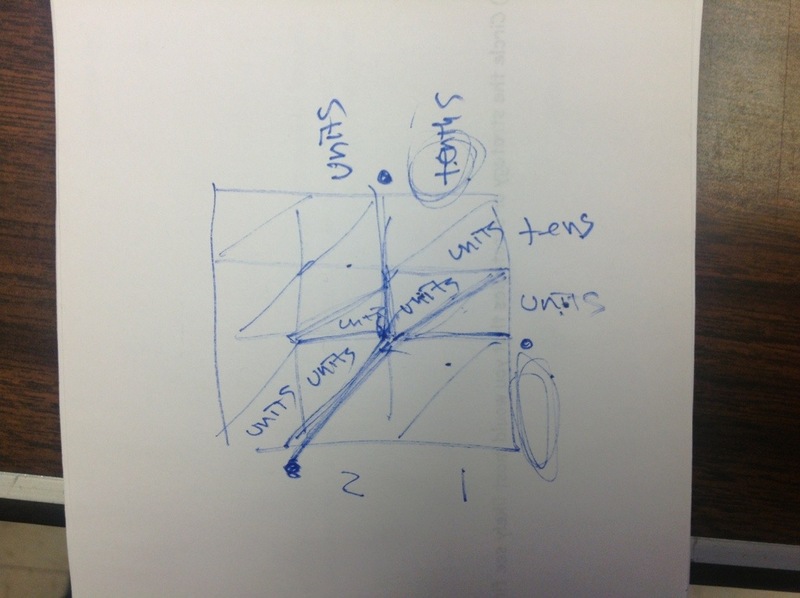 I have used the lattice algorithm for years with my future elementary teachers. We learn the steps in class, they go off and practice it. And then they write about it, using the ideas of the course to analyze the algorithm. The lattice algorithm is very good for teaching place value because you have to pay attention to the places as you work with it. I could not disagree with this claim more strongly. As I work the lattice, I am going digit-by-digit. I am absolutely NOT thinking about the values of those digits. And I suspect most children are not either. This makes it an efficient algorithm. Last semester I decided to put that claim to the test. If these future teachers thought the lattice algorithm exposes important ideas of place value, then what task could I give them to demonstrate that it does not? Well, they have been analyzing the algorithm; they have written papers about it. 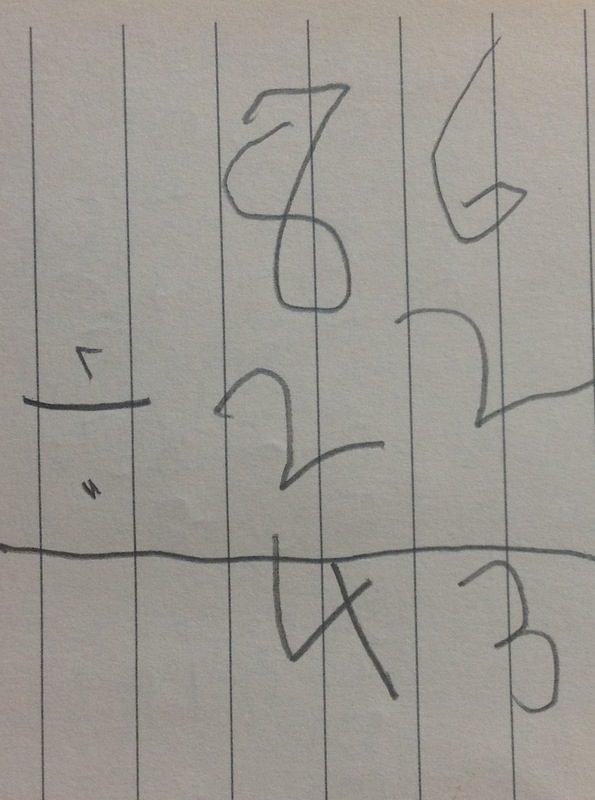 So if it teaches place value, they should be able to ace any place value task involving the lattice, right? So here’s the task: Perform the lattice algorithm to multiply 7,343 by 1,568. 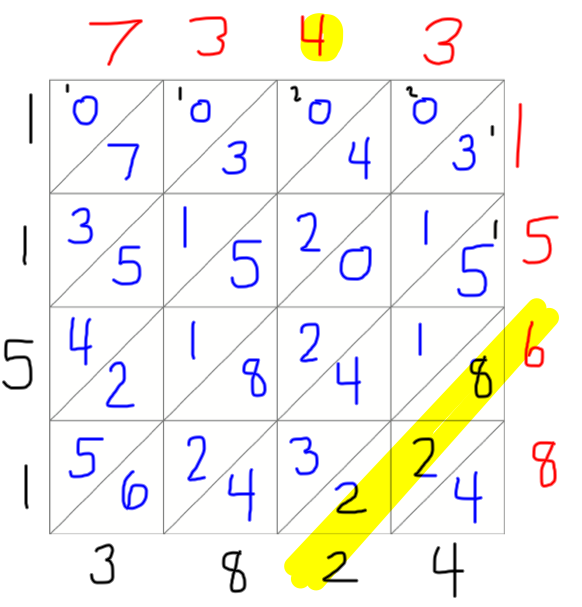 When you are done, use a marker to highlight each and every tens digit in the lattice. No follow-up or clarification questions allowed. If the premise is that the lattice helps us to learn place value, then we should know enough about place value to make a commitment to the meaning of a tens digit. Can you guess which of the answers below is the more popular in my classroom? When both are presented, a really useful discussion of the algorithm and its position with respect to place value ensues. And that discussion helps to explain the really clever “slide trick” for placing the decimal point (as seen about 2:30 into this video). But back to my point. I can tell my students that the lattice doesn’t bring place value understanding along for free. Or I can show them. Showing requires carefully crafted tasks. But I find it’s worth the time. When I have the choice between telling and showing, I nearly always choose to show. Which is why I’m always running behind on content coverage. I made my peace with that years ago.